What are children capable of learning at various stages in their development? How do children develop the intellectual skills to react and interact with their environment? How do these cognitive abilities develop, and in what order? These were some of the questions that were answered by French psychologist Jean Piaget in 1952 when he published his groundbreaking theory on cognitive development in children. Piaget began his research simply interested in how children react to their environments, but his observations countered the current thinking of the day (which said that children have no cognition until they are old enough to learn to speak), and have, in fact, become the most well-known and influential theory of cognitive development to date. Sensorimotor Stage: Birth through about 2 years. During this stage, children learn about the world through their senses and the manipulation of objects. Preoperational Stage: Ages 2 through 7. During this stage, children develop memory and imagination. They are also able to understand things symbolically, and to understand the ideas of past and future. Concrete Operational Stage: Ages 7 through 11. During this stage, children become more aware of external events, as well as feelings other than their own. They become less egocentric, and begin to understand that not everyone shares their thoughts, beliefs, or feelings. Formal Operational Stage: Ages 11 and older. During this stage, children are able to use logic to solve problems, view the world around them, and plan for the future. The Information Processing Model further expands our understanding of the development of cognition in children. Developed in the two decades following the publication of Piaget’s theory, this model explains how and when a child’s core cognitive skills are developed. Cognitive skills include attention, short term memory, long term memory, logic & reasoning, and auditory processing, visual processing, and processing speed. They are the skills the brain uses to think, learn, read, remember, pay attention, and solve problems. If Piaget’s theory explains what a child is capable of doing at different stages in his or her development, The Information Model take a closer look at the specific cognitive skills at work behind the scene. According to this model, attention, short-term memory, and long-term memory are developing between the ages of 2 and 5. Auditory processing, which is critical for good reading skills, is developing between the ages of 5 and 7. Logic & reasoning also becomes more established during after 5 years of age as a child becomes better able to make connections between ideas. Everyone has different cognitive strengths. For example, some people have exceptionally strong memory skills, while other people excel in logic & reasoning. The same can be said for cognitive weaknesses. These children, ages 7 through 13, came to LearningRx because they were struggling with attention, memory, or keeping up with schoolwork/homework. A comprehensive Cognitive Assessment pinpointed the weak skills at the root of their struggles. The good news is that cognitive skills are not set in stone. If weak skills are identified, they can be strengthened through cognitive training, often called brain training. Brain training uses fun, challenging mental exercises to target and improve weak cognitive skills. Cognitive strengths and weaknesses have a huge impact on whether we are successful—or whether we struggle—when it comes to thinking and learning. Cognitive profiles, however, are not set in stone. They can be changed. The process begins with identifying weak skills through a Cognitive Assessment, then strengthening those skills through intense mental exercise also known as brain training. Here, for example, is a look at Child A’s cognitive performance before and after brain training. The chart on the left shows how this child was performing before brain training. 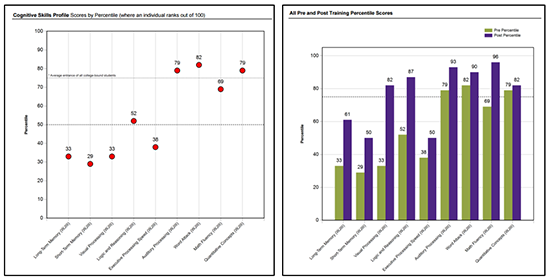 The chart on the right shows the improvement in each skill after brain training (the green bars show “before training” and the purple bars show how that same skill performed “after training”). If your child is struggling with learning, reading, attention, or memory, the next step is to find out why. A Cognitive Assessment takes about an hour and will give you a detailed look at how your child is performing cognitively, and will identify specific strengths and weaknesses. Call a LearningRx brain training center near you and schedule a time for your child to take the assessment.